The Twin Peaks company has revoked the franchise agreement for its restaurant in Waco, Texas, the scene of a biker shootout that killed nine people this weekend. "We will not tolerate the actions of this relatively new franchisee and are revoking their franchise immediately," said the Dallas-based company. The company laid the blame on the managers of the Waco franchise who "chose to ignore the warnings and advice from both the police and our company, and did not uphold the high security standards we have in place to ensure everyone is safe at our restaurants." The restaurant had already been shut down for a week following the fatal gang shootout on Sunday. "The Twin Peaks restaurant where the fight occurred will be closed for the next seven days out of a concern about further violence," Waco Police Sgt. W. Patrick Swanton said Monday. In an interview with CNN affiliate KTVT over the weekend, Swanton criticized Twin Peaks for ignoring the police department's advice to keep biker gangs away from the restaurant. "We feel like there may have been more that could have been done by a business to prevent this," said Swanton, noting that police had expected trouble with the bikers and had a marked SWAT truck standing by, in full view of the bikers, just before the fight broke out. "They absolutely have a right to refuse service to people that may be a harm to their patrons and employees. They didn't do that, and today is the ultimate aftermath of what their decision was." The Waco restaurant had just held a "Bike Night" on May 14. 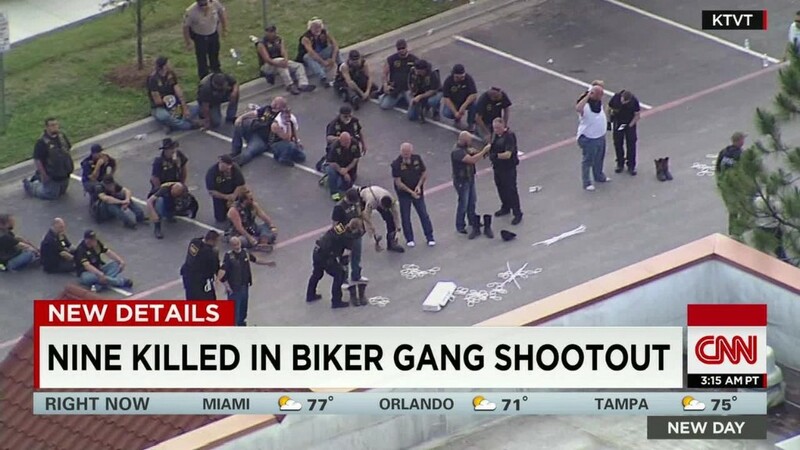 Waco police also said that more than 170 people have been charged with engaging in organized crime, following the Sunday fight between at least five motorcycle gangs. Jay Patel, operating partner of Twin Peaks Waco franchise, had earlier said on Facebook (FB) that he considers "the police our partners" in creating a safe environment. The eatery is a franchise member of the Twin Peaks chain of sports bar-style restaurants, featuring scantily clad waitresses toting beer in frosted glasses. The log cabin décor is meant to suggest a rugged, lumberjack-style theme. The restaurant had scheduled a bikini contest for Wednesday, where customers would have been able to "see your favorite girls walk in out on the runway to compete for the title of Miss Twin Peaks Waco!" "Our thoughts and prayers are with the families and victims of the tragedy at franchise partner's restaurant in Waco," tweeted the Dallas-based company, which has 13 restaurants in Texas, more than any other state. -- Holly Yan and Jennifer Duck of CNN contributed to this story.